Location: Caddies on South St Jimboomba or your business. 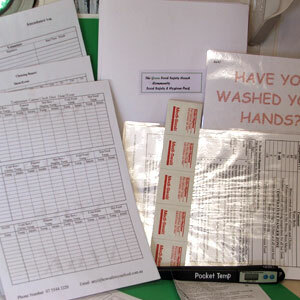 An all in one kit containing templates of temperature and cleaning reports as well as an Attendance Sheet, so you can show who was there on the day. There is also a basic fundraising checklist to help you set up the fundraiser. A food grade thermometer is included in the kit, as well as a few sanitising swabs to get you started. The hand wash poster can be used to mark which sink is only for washing hands. No need to make up your own sheets or go searching for a suitable thermometer. Laminated copies are included so all you need to do is photocopy in future. All the basic food safety tools and documents needed for fundraisers in one kit.